Who was doing paintings like this in 1950? Jackson Pollack, Willem De Kooning and Salvatore Grippi and a few others. It is hard to put a price on a work like this because the artist does not have auction results for this kind of painting. Based on the merit of the work it should be quite valuable. 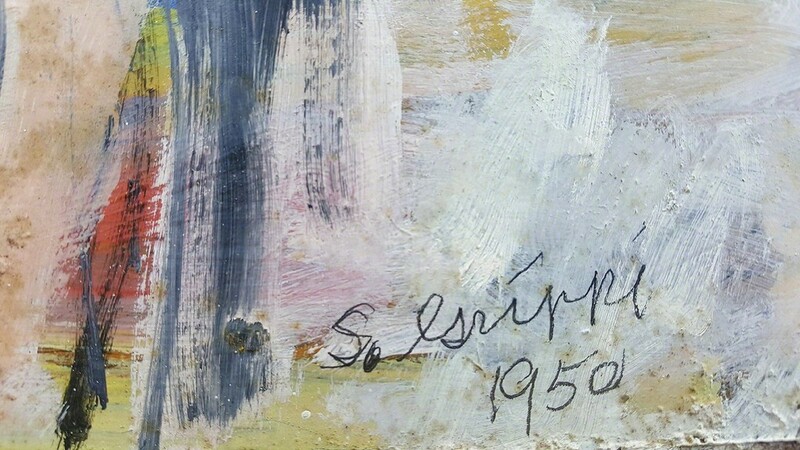 Grippi exhibited with the giants of the movement Kooning, Nevelson, and Kline. The work has some a lot of foxing and surface condition issues that we will be fixing. However, in person, this work sings with an all-over composition and complex beauty of an action painting done 1950. Grippi's work is in the collections of the MOMA, The Whitney, The Met., The Library of Congress and the Hirshhorn Collection. In the1950's he was with the Zabriskie Gallery. In 2011, he was honored with a solo retrospective at Cornell University's Johnson Museum of Art. Salvatore Grippi was my art professor at Ithaca college from 1970- 1971. Work is in original simple and minimal wood frame.